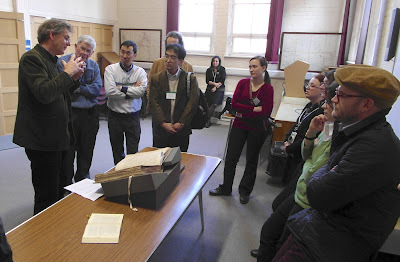 The 5th of March, 2013, the participants of the Eighth Birmingham Colloquium on the Textual Criticism of the New Testament visited the Leicester Record Office in order to take a look at the famous Leicester Codex, minuscule 69. The manuscript is very interesting. As a member of family 13 (the so-called Ferrar group, or φ), it links Britain to Southern Italy in mysterious ways. The manuscript was studied by Erasmus during his stay in Cambridge (1510-1515), in the years that Erasmus’ New Testament project still consisted of hardly more than critically collating and annotating the text of the Latin Vulgate with whatever Greek sources he could find. Some of the particular readings of min. 69 subsequently found their way into Erasmus’ Annotationes. During our visit, we were drawn into yet another interesting aspect of the manuscript’s history, namely a set of marginal notes to the word Ἀντιπᾶς in Revelation 2:13 (f. 203r). Originally written Αντειπας and the erasure and alteration of τιπ in blacker ink is obvious. There is no erasure or alteration. S.P. Tregelles. Dr. Tregelles is certainly correct – O. T. Dobbin. After careful study of the passage, we (Tommy Wasserman and Jan Krans) could not but fully agree with Tregelles’ and Dobbin’s judgment. In fact, it is amazing to see with what ease people then and now cover the margins of manuscripts with such trifles. This post is published on both the Amsterdam New Testament Weblog and Evangelical Textual Criticism. Over at his new website, Brice Jones has published a review of The Early Text of the New Testament (eds. Kruger & Hill). I note with satisfaction that this reviewer "found the approach and format of Wasserman’s essay to be the most clear of all the essays." However, the most interesting aspect of the review is that Jones identifies a theological agenda behind two of the articles (Charlesworth and Kruger): "In sum, it seems apparent that there is a theological agenda behind both Kruger's and Charlesworth's articles. The conservative and apologetic undertones in their arguments are clear." Overall, this book is an important addition to our field and thus is to be recommended to anyone interested in the text of the New Testament, in spite of the apparent apologetic predispositions on the part of the editors. Go ahead and read the whole review here and welcome to comment! Update: I just went through the typos that Brice Jones identified in my essay, and this makes me so disappointed with Oxford University Press – they are responsible for all the typos. In any case, the most embarrasing thing is that OUP has managed to duplicate my chart for P77 and insert it under P70 (including a typo). So, here is the correct chart for P70 (p. 97) which any owner of the book can print out and insert. At some point someone made a mistake. Unfortunately, I did not read the proofs as I should have! (why don't I learn the lesson). Brice Jones has a new web-site with a blog and papyrological resources. On his blog he reviews the recent book The Text of the New Testament in Contemporary Research: Essays on the Status Quaestionis (although he mostly comments on only two chapters); he also discusses P. Oxy. 1151 and the text of the NT (it cites John 1.1 and 3). James McGrath offers a helpful visual showing how useful the KJV is compared with the original autographs (he seems to think it is silly, but I agree with every point). Josh Mann has an interesting discussion about pagination (which links to my long awaited paper on 'Turning the Page and its impact on the NT textual tradition'). Michael Patton posts a list of the top selling Bibles in America in 2012. Drew Longacre has a call for papers for the 3rd University of Birmingham Biblical Studies Postgraduate Day Conference Call for Papers on his blog. Given the location (Birmingham, UK, not Alabama) and the theme "Unity and Diversity in Text and Tradition", papers on TC will be very appropriate. In November of 2011 CSNTM traveled to the Biblioteca Medicea Laurenziana (BML) in Florence Italy. This is a phenomenal library founded by the Medici family. Here, the old library, which was designed by none other than Michelangelo himself, can be seen in all of its glory. It now holds over 2500 papyri, 11,000 manuscripts, and 128,000 printed texts. Because of this trip, CSNTM is proud to announce the addition of new images of 28 manuscripts from the BML. This excellent collection contains papyri, majuscules, minuscules, and lectionaries. Among the many treasures we digitized was an eleventh-century lectionary, written entirely in gold letters (GA Lect 117). Another manuscript had Paul’s epistles after the book of Revelation—a very rare phenomenon GA 620). And we photographed a complete Greek New Testament manuscript—one of only sixty known to exist (GA 367). We thank the library and their staff for their graciousness and willingness to digitally preserve these manuscripts. The following manuscripts may now be found HERE. P35, P36, P48, P89, P95, 0171, 0172, 0173, 0175, 0176, 0207, 198, 199, 200, 362, 365, 366, 367, 619, 620, 1979, L112, L117, L118, L291, L510, L604, L2210. Sometimes it is a pain to get your head around what a manuscript actually reads, especially when there are corrections involved. The image below is from the Codex Ephraemi rescriptus 'C', though it is only 'rescriptus' here in Acts 23:6 because of the erasure. The question is on νεκρων [εγω] κρινομαι. A clear erasure is visible under the rewritten letters εγω κριν, and possibly also under the following ο. The next two letters -με (itacism for -μαι) seem to me written on virgin material. 1) The erased area is long enough to contain κρινομαι, but we don't know this for sure. 2) Initially I thought that this must have been a correction in scribendo, but this is not clear at all - the space after the original reading is likely to have been blank anyway, leaving room for the corrector to rewrite as εγω κρινομαι. 3) The letters -με may not have been written by the original scribe. I do not know the hands in this manuscript well enough, but there seems to me enough difference to assume this. (Knowing the spelling patterns of the scribe and correctors would help). 4) That the original scribe wrote κρινομαι instead of εγω κρινομαι, is a likely guess (since there are few alternatives), but this is not visible enough to make this a Cvid reading. 5) NA27 had Ephaemi supporting εγω κρινομαι as follows C(*), while NA28 has C2. The latter does not give us an idea what C* wrote, and this is probably correct. How to represent this in a full critical apparatus, is a tricky problem, I don't think you can avoid putting in a note that the erased area matches the length needed for just κρινομαι. And that might help Vaticanus 'B' (the only Greek witness that justifies the square brackets in the NA texts) getting out of its isolation at this point - Ephraemi might have read simply κρινομαι, with Vaticanus. In a comment to the previous post on a reassessment of the date of the early NT papyri, Christian Askeland mentioned a new resource for the study of ancient paleography, PapPal, which certainly deserves to be mentioned in a main post. We are pleased to announce the launch of PapPal (www.pappal.info), an online resource for the study of ancient paleography. The site currently gathers thumbnail images of over 2500 dated Greek documentary papyri from collections around the world, which can be displayed either in gallery or slideshow mode. Links direct users to full images and further information at the host sites and to metadata and transcriptions at papyri.info. At the moment, there are only a handful of ostraka included. In the coming months we will be adding more of them, as well as dated Latin documents. I hope that you will take some time to explore the site and send me your comments. Work on this project has been made possible by the Deutsche Forschungsgemeinschaft in the context of the University of Heidelberg's Cultural Research Center 933. Material Text Cultures: Materiality and the Presence of Writing in Non-Typographic Societies, with further support from the Institute for Papyrology. Abstract :The date of the earliest New Testament papyri is nearly always based on palaeographical criteria. A consensus among papyrologists, palaeographers and New Testament scholars is presented in the edition of Nestle-Aland, 1994. In the last twenty years several New Testament scholars (Thiede, Comfort-Barrett, 1999, 2001 and Jaroš, 2006) have argued for an earlier date of most of these texts. The present article analyzes the date of the earliest New Testament papyri on the basis of comparative palaeography and a clear distinction between different types of literary scripts. There are no first-century New Testament papyri and only very few papyri can be attributed to the (second half of the) second century. It is only in the third and fourth centuries that New Testament manuscripts become more common, but here too the dates proposed by Comfort-Barrett, 1999, 2001, and Jaroš, 2006 are often too early. I have compiled a small table demonstrating that the critique for a general tendency to date early in “theological palaeography” is not applicable to the Nestle-Aland edition. In spite of some significant differences, we see that seven papyri or uncials are still dated potentially to the second century (P30, P52, P4+64+67, P90, P104, 0171, 0212) . However, now three papyri in the second-century range in NA, are dated to the third century by Orsini and Claryssee (P77, P98 and P103), one uncial in the second-century date in NA is assigned to the fourth century (0189). Conversely, Orsini and Claryssee assign two papyri and two uncials in the second-century range (P30, P4+64+67, 0171, and 0212) which NA has dated later. Perhaps the most significant difference here is 0171 which Orsini and Claryssee think is 125 years earlier! Some seven years ago, Peter Head compiled a useful blogpost with advice on how to check patristic citations (link in the right margin). Recently, IGNTP committee members Rod Mullen and Mike Holmes, both involved in the SBL series The New Testament in the Greek Fathers, took the initiative to compile a bibliography of work on the New Testament text of Greek authors. The list "keeps track of recent work on establishing the biblical text in patristic writers. It includes the volumes published in the SBL New Testament in the Greek Fathers series, as well as a list of work in progress." The Biblindex = Index of Biblical Quotations and Allusions in Early Christian Literature is maintained by Laurence Mellerin et al. of the Institut des Sources Chrétiennes. It includes all the 270.000 references in the published Biblia Patristica volumes, and an additional ca. 130.000 references on Athanasius of Alexandria, John Chrysostom, Theodoret of Cyrus, Procopius of Gaza, Jerome and more. Access to data is free, after registration. This is a real treasure trove. I will update Peter's original blogpost with this information.